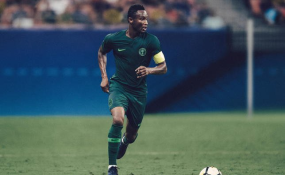 Super Eagles captain, John Obi Mikel played his first game since his involvement with Nigeria at the World Cup as his Chinese side Tianjin Teda forced visiting Jiangsu Suning FC to a 1-1 draw. There has been talks about the captain following in the footsteps of Victor Moses who recently retired from the national team of Nigeria but his intermediary told Owngoalnigeria.com that such plans are presently not part of his future plans. Tianjin Teda coach Uli Stielike has admitted that he was pleasantly surprised by the performance of Super Eagles captain John Obi Mikel in his side's 1-1 home draw against Jiangsu Suning on Saturday in the Chinese Super League. The former Chelsea star was reinstated to the starting lineup after Brazilian striker Johnathan failed a fitness test and the German coach was delighted that the central midfielder played at a high level in his first game after recovering from a knee injury. "I was very satisfied with Mikel, he didn't play because of injuries," Uli Stielike said at the post-match press conference. "I didn't expect him to play 90 minutes of a high-intensity game. His height was an advantage in grabbing the point, including his experience in midfield. "His performance was very good." Mikel has started and gone the distance in 13 Chinese Super League matches this season and was not considered for six matches, one as a result of a suspension.